The United States has the dubious distinction of being one of the only developed countries to still embrace the death penalty for criminal offenses. We share this distinction with bastions of progress and enlightenment like North Korea, Iran, Saudi Arabia, Russia and Yemen. 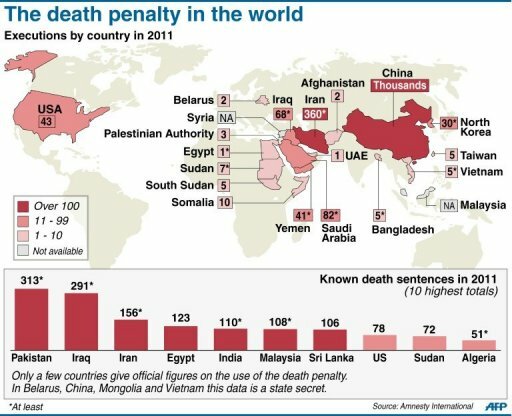 Unlike the USA, most western countries have long decided that the death penalty is a punishment which is too extreme and cruel for even criminals to suffer–in spite of this consensus abroad, many Americans remain supportive of the death penalty and the United States Supreme Court has merely drawn the line at executing minors and the mentally ill (although Florida and Texas have flaunted this line and have executed mentally retarded individuals). 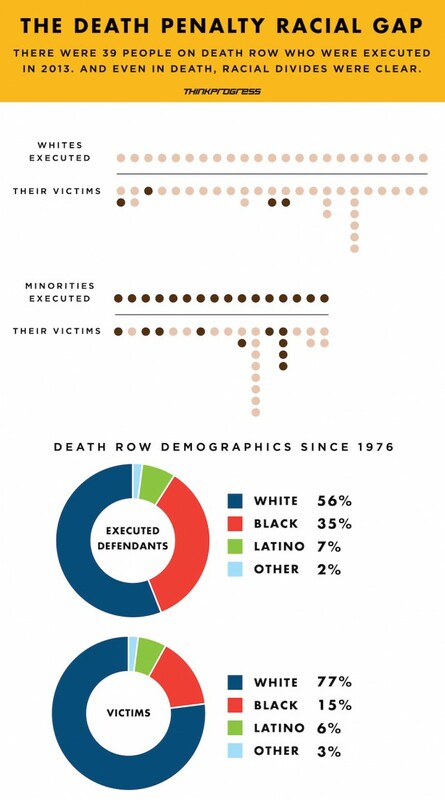 In the years since the 1967 Gregg v. Georgia Supreme Court decision codified the process by which death sentences were constitutionally handed down, approximately 1,400 Americans have been executed while over 3,000 Americans currently sit on death row–most of these condemned Americans are male, racial minorities, clustered in southern states and California (which has over 700 people on death row, but has only executed 13 in recent years). Personally, I believe that there are crimes so heinous that they deserve death (Case in Point: mass-murderers of children like Anders Breivik and Adam Lanza or serial killers like Jeffrey Dahmer and Ted Bundy), but have come to the conclusion that the evidence shows that there is no way for the current American justice system to fairly implement any death penalty. The evidence surrounding the real-life application of death penalty indicates that there are several fatal defects and human errors that make it absolutely irresponsible and immoral for any state to actually carry out death sentences. Biases and mistakes endemic to the criminal justice system have made it impossible to support the real-life execution of the death penalty, even if one supports the sentence in theory. First and foremost, dozens of Americans who have been sentenced to death were later either exonerated on appeal and saved, or exonerated after they were executed—these dozens are just those who have been PROVEN innocent, and it is almost certain that several times this number are innocent, yet were unable to prove it. This error rate in those convicted and sentenced to death indicates that we have no way to ensure that our country isn’t executing innocent people along with the criminals. 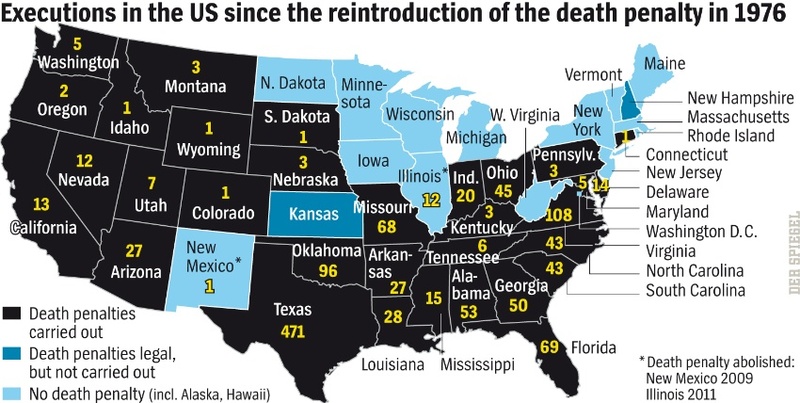 Put simply, the death penalty has caused the United States government to essentially murder numerous Americans in all of our names. 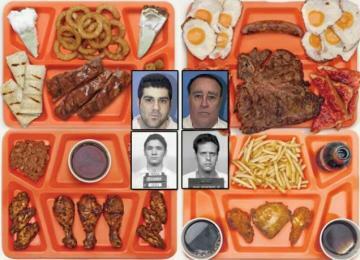 These are the last meals of a few men who were found to be innocent after they were executed. It is the height of immorality to let the death penalty continue when we know that the death sentence has such a high error rate. The fact that we are killing the innocent, in and of itself, is reason enough to immediately cease all executions in favor of commuting sentences down to life without parole. The sentence of life without parole prevents dangerous criminals from remaining in society, while it also ensures that the innocent will not be killed before their innocence can be established. In short, it is constitutional to execute somebody who has been proven to be innocent, just as long as you convicted them at trial without making a legal mistake that would justify an appeal. Personally, I see this view as a perversion of justice, but highly informative as to why many states continue to kill—they use the justice system as a shield to avoid all culpability for their actions when they are pursuing some sort of fantasy of revenge. The second flaw in the application of the death penalty is that it is not equally applied to all Americans. Men are far more likely to be executed than women, racial minorities are far more likely to be executed than whites, and the poor are far more likely to be executed than the rich. Nationwide, 42% of death row inmates are black—this is caused by the facts that black defendants are more likely to be convicted of serious crimes (jury bias) and are far more likely to face the death penalty than whites who are convicted of similar crimes. 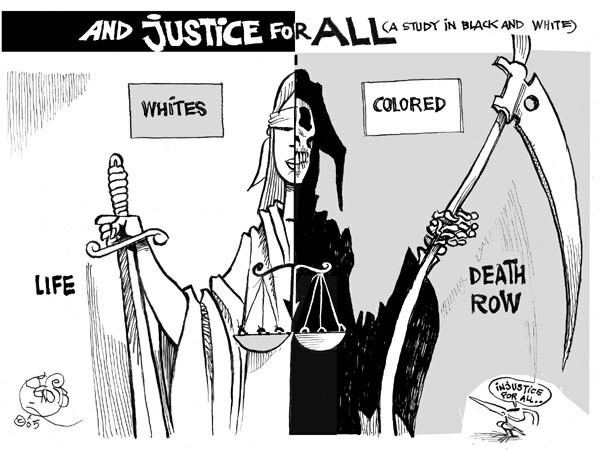 In some cases, the racial bias surrounding the death sentence comes to the forefront and becomes overt racism. For example, in 2000, a Texas man named Duane Buck was sentenced to death, partly because a prosecution consultant testified that the fact that Buck is black makes him more violent, thus more dangerous to imprison. Despite the obvious racism and falsity of this claim, Texas appeals courts have rejected Buck’s appeals of his death sentence and, as of his last failed appeal in late 2013, Buck is still sentenced to die. For a law to be fair and constitutional, it must be applied to all Americans equally; as the statistics surrounding the death penalty demonstrate a clear racial bias in sentencing, there is no way to guarantee the equal application of the statute. Given these demographic biases within the application of the death penalty, it is clear that the death sentence is violating the equal protections clause of the 14th Amendment, thus is unconstitutional. The death penalty was previously invalidated in the USA under these exact grounds by the Supreme Court’s 1972 Furman v. Georgia decision. This moratorium on the death penalty was short-lived, as the 1976 Gregg v. Georgia decision set down a framework by which the death penalty could more equally be applied, thus opening the door for executions to be carried out again. As the Gregg v. Georgia guidelines have demonstrably failed to elicit equal results, the spirit of the Furman v. Georgia decision should remain valid. The only reason why the death penalty was allowed after the Furman decision was that the Gregg framework was purported to fix the equality problem–it didn’t, thus we should default back to the position of the Furman ruling unless another method of determining equal application is found. Unfortunately, given the dominance of the five right wing Muppets on this current Supreme Court, I seriously doubt that such a decision is at all feasible. The third flaw in the application of the death penalty involves how the states actually go about killing the condemned. Currently, states which still practice the death penalty are faced with a shortage of approved death penalty drugs because the European manufacturers have begun to refuse to sell them for use in execution—this shortage has led these states to start using untested and undisclosed narcotic blends to kill people. Put simply, states have started to blend different lethal narcotics together and use them to kill people, when they have no clue about how painful the process will be, how long it will take, or even whether or not it will be effective. To further compound this problem, they refuse to disclose the true nature or formulation of the drugs that they are using, making independent studies impossible. In recent months, we have seen several nightmare executions, where the condemned takes a great deal of time to die and begins seizing during the process. The most publicized of these executions was the one where Dennis McGuire seized, choked and slowly suffocated for nearly half an hour before he eventually died. These prolonged executions are a clear violation of the 8th Amendment prohibition on cruel and unusual punishment (the state can kill you, but cannot torture you while doing it) and are believed to be a direct result of the states’ use of untested drug cocktails. Until a uniform and humane method of execution can be found, the entire practice should be halted. 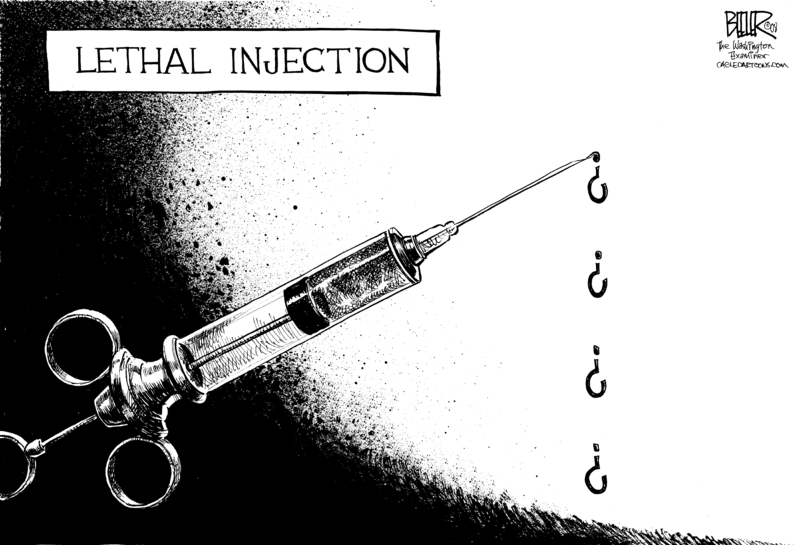 Unfortunately states appear to be moving in the exact opposite direction in the face of drug shortages and scandals surrounding untested drug: several states are currently considering bringing back firing squads, electric chairs, and gas chambers as their primary methods of execution. The United States must join the rest of western civilization by banning executions in favor of life imprisonment without the possibility of parole. This solution ensures that the most dangerous criminals don’t ever get free, that innocent people don’t get murdered by the state, and that the United States finally escapes the international stigma of being a society that sanctions legal killings shared by countries like Iran and North Korea. There is literally no down side to this policy path and we should take it as soon as possible. Far be it from progressing to join the rest of the civilized world, the United States is devolving on the issue of the death penalty and is beginning to approach the level of barbarism found in countries which practice public beheading as their method of execution (at least that is quicker than a slow suffocation via paralysis, brought on by untested drugs). Our judiciary has said that the innocent can still be executed, while our states have begun to experiment with untested execution drugs, and even bring back infamous execution methods like the gas chamber and firing squad. I use to believe there were times the Death Penalty was appropriate. Since becoming a victim of violent crime and then a volunteer in the Victims Impact Program, I have changed my mind. There is never an appropriate time, never a right time. I am not saying every person can be redeemed, some cannot. However, the state should not take life. The simple fact that we have a death penalty puts us in VERY bad company and is a blight upon or country’s moral standing (not that torture, preemptive war, drone assassinations, deposing democratically elected presidents, and horrific domestic gun violence have left us with a great deal of moral standing, death penalty aside). There is a type of near-universal social contract/morality that spreads across culture lines which states that the government killing prisoners is wrong–we, apparently, have let our desire for vengeance to overshadow our morality. I am sorry to hear that you were the victim of a crime, but it is great that you turned such a bad situation into a reason to help others. All the drugs are very well tested and their pharmacological characteristsics are well known and don’t change because they are used in executions. Compounded drugs like those used in some executions are most certainly not tested (they are untested blends of tested drugs).